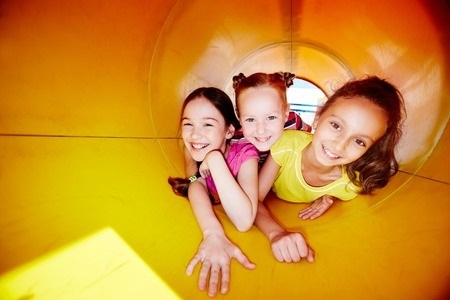 Encourage Playground Play Time | Rubber Safe Playgrounds Inc.
As weather takes a turn for those worse, it’s easy to fall into the trap of letting your kids sit inside in front of the TV or tablet. Although a lot of the programming is educational and beneficial for children, there are a lot of benefits that technology can’t offer. Real-life playground play time is still extremely important: here’s why you should encourage playground time with your kids. Time spent on the playground isn’t just about playground politics and swing sets: it’s actually good for your kids to physically get moving on a regular basis. To keep your kids healthy, and to keep their bodies growing strong, they must spend time being active and playgrounds are a great place for this to happen. Monkey bars, slides, hopscotch, and so much more improve your kids’ fine motor skills, and help keep their muscles strong. Playgrounds also encourage your kids to grow emotionally. They’ll build up their self-confidence by overcoming challenges, and build empathy and kindness by interacting with the other kids on the playground. It may seem silly, but your kids actually do need to learn how to make friends: and the playground is a great place for them to practice. While your child plays, he will be improving his sense of coordination, learning how to think critically, and learning how to be spontaneous and go with the flow. The varied ages of the kids at the playground will challenge your child, and this is all critical to his cognitive development. Now that the weather is a little milder, take your kids to the playground this weekend and let them interact with the other kids in the neighborhood before. Looking to build or improve a playground in your neighborhood? Visit the Shredded Mulch website to learn about how rubber mulch benefit playgrounds.